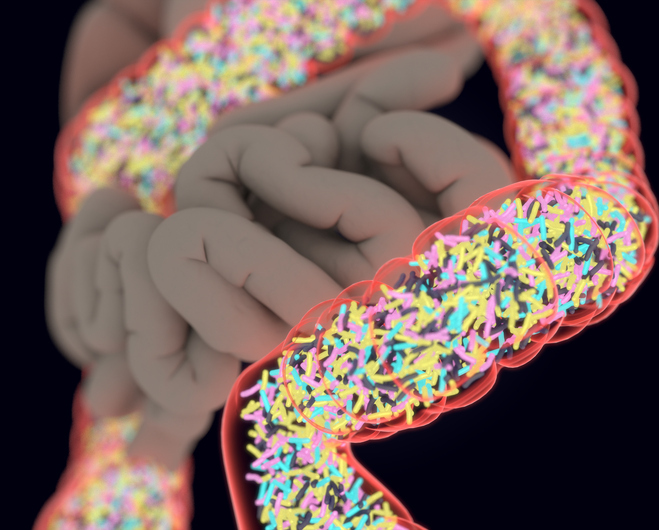 Changes in gut bacteria have been linked with the development of age-related disorders and chronic diseases, and research suggests that targeting the microbiome as part of the gut–brain axis (GBA) may represent a therapeutic approach against some age-related conditions. Scientists at McGill University in Montreal have now shown how a combination of a probiotic formulation and a herbal supplement used in traditional Indian medicine can extend the lifespan of male Drosophila melanogaster fruit flies by 60% and protect against age-related inflammation, oxidative stress, and insulin resistance, as well as improving mitochondrial function. The researchers, headed by Satya Prakash, Ph.D., a professor of biomedical engineering in McGill’s Faculty of Medicine, hope that the combination of probiotics and the prebiotic Triphala formulation could help to prevent or treat human disorders ranging from diabetes and obesity, to neurodegeneration, chronic inflammation, depression, irritable bowel syndrome, and perhaps even cancer. They have already filed a provisional U.S. patent and set up a company to continue R&D. “The effects in humans would likely not be as dramatic, but our results definitely suggest that a diet specifically incorporating Triphala along with these probiotics will promote a long and healthy life,” says Dr. Prakash. To study the effects of their combined probiotic and synbiotic formulation on D. melanogaster longevity, the McGill team added individual or combined probiotic and synbiotic formulations to the flies’ normal diet, and counted the number of living flies daily for 30 days. The probiotic formulation comprised two Latobacillus and one Bifidobacteria strain, while the polyphenol-rich prebiotic herbal supplement, called Triphala (TFLA), is made from amalaki, bibhitaki, and haritaki fruits, which are used in traditional Ayurveda medicine. Drosophila flies fed the control diet had a maximum lifespan of 40 days, whereas flies given a diet including either a probiotic or TFLA had a 14- to 16-day increase in longevity, while flies treated with the probiotic or symbiotic (probiotic plus TFLA) formulations lived for 24 to 26 days longer than the control flies. Treatment with either the probiotic or symbiotic formulations was also associated with reductions in total weight in aging flies, and better control of glucose, which increased by 2.5-fold in 30 day-old control flies. The synbiotic formulation was the most effective at controlling age-related increases in glucose than any of the individual probiotics, or TFLA alone. “Notably, both the probiotic and synbiotic formulation completely rescued the elevation in total glucose by day 30,” the authors write. And while total triglyceride levels increased 1.7-fold in untreated controls by day 30, the probiotic and synbiotic formulations completely reduced the total triglyceride levels to the level of just-hatched flies. Further studies showed that insulin-like signaling in aging flies was positively affected by the probiotics and TFLA. While individual probiotic formulations and TFLA had positive effects on insulin-signaling pathways, the probiotic and synbiotic formulation demonstrated “combinatorial effects on rescuing the underlying insulin signalling dysregulation in aging Drosophila,” the team writes. Fatty acid metabolism was also improved by supplementation using the probiotic and synbiotic formulation in aging male flies, while both the probiotic and synbiotic formulations reduced age-related increases in inflammatory markers to a greater degree than did the individual probiotics or TFLA alone. The researchers' studies demonstrated that mitochondrial function declined with aging in control flies, evidenced as reduced activity in each of the four mitochondrial electron transport chain (ETC) complexes. Encouragingly, adding probiotic or synbiotic formulations to the animals’ diets led to improvements in the activity of ETC complex activity, “which is very significant in demonstrating how a probiotic treatment can influence mitochondrial complex integrity and consequently the production of ROS particles,” the authors state. The researchers further suggest that increasing our undertanding of how gut microbiota and probiotic treatments impact on aging metabolic pathways may help in the development of specific formulations that, if taken early in life, could prevent the development of chronic diseases. “Probiotics dramatically change the architecture of the gut microbiota, not only in its composition but also in respect to how the foods that we eat are metabolized,” says Dr. Prakash. “This allows a single probiotic formulation to simultaneously act on several biochemical signaling pathways to elicit broad beneficial physiological effects, and explains why the single formulation we present in this paper has such a dramatic effect on so many different markers”.